Pick up the shovel and string. Use the shovel to dig a hole where the skull is. Attach a rope to the chest. 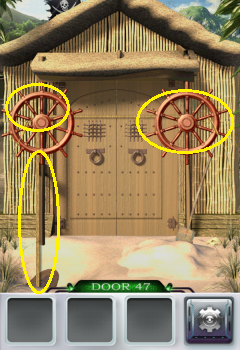 Tap the chest and pull up to the left red wheel to attach the string to it. Tap the left red wheel then the right red wheel. Open the chest and get the key.